Maureen Corr was born in Armagh, Northern Ireland. She emigrated to the United States in 1943, living with family in New York City. There she pursued the education she had missed due to a long and difficult childhood illness, eventually graduating from New York City's Hunter College in English. She joined ER's office staff in 1950 as Malvina "Tommy" Thompson's assistant. 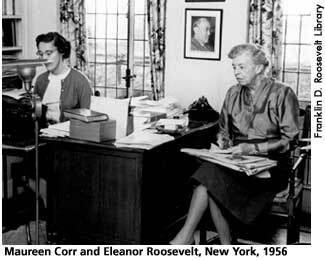 Upon Thompson's death in 1953, Corr filled her post as Roosevelt's personal secretary. In addition to her standard secretarial duties, including answering correspondence, Corr often traveled with ER. She also helped the family close the office after Roosevelt's death. Her subsequent positions included work for the Eleanor Roosevelt Memorial Foundation (1963-65), the Asia Society (1966-69), and the U.S. Mission to the United Nations. In retirement, she continues to reside in New York City. Beasley, Maurine H., Holly C. Shulman, and Henry R. Beasley, eds. The Eleanor Roosevelt Encyclopedia. Westport, Conn.: Greenwood Press, 2001, 108-110.